I'm Blades, he's Wilson and we have 2 small boys. Currently living in Yangon, Myanmar (Burma) I'm a 40-something actress and mum, blonde bit of fluff and sometime Sybil Fawlty impersonator... writing about expat life and parenting. 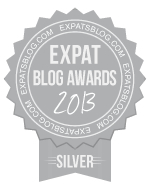 ExpatsBlog.com Expat Blog Awards 2013: Myanmar Silver Award! This blog won the Silver Award for best expat blog in Myanmar!